Update: Please see the Easy Adjustable Slippers Version 2 for the new and improved updated version of this pattern, along with step by step photos for visual learners! This crochet pattern is very versatile since you can create different slipper styles just from this one pattern. Using the easy adjustable slipper pattern you can crochet slippers for everyone in the family, whether they are for men, boys, women, girls or even babies. The original pattern is written for size 6 women, but this pattern is meant to be altered to fit anyone. Just follow the simple instructions to alter the size and style of your slippers. Finished Size: Any size you want it! Gauge: not important. For best fit, measure foot size and follow instructions for altering slipper. Note: Round 1 – 8 starts the toe of the slipper by creating a circle. For best fit, make sure that the diameter of the circle is slightly smaller than the width of the wearer’s foot. To adjust the circle size, simply add or subtract rounds as needed. Continue increasing the circle until the diameter is slightly smaller than the width of the wearer’s foot. Note: Round 9 – 27 creates the front/toe of the slipper. You may choose to make this portion as long or short as you desire. To adjust length add or subtract rounds as needed. The length of the slipper upon completion of these rounds should not go pass the ankle of the wearer’s foot. Continue until the desired length of the front of the slipper is obtained. Note: Row 28 establishes the length of the two sides plus the bottom of the slipper. The length of this row should be greater than the diameter of the slipper. 30 single crochets is the recommended length that is used in this example. You may increase or decrease the number of single crochets made to better fit your slipper size. Note: Row 29 – 43 creates the rest of the slipper, which includes heal and back of foot. Upon completing this set of rows your slipper should exactly reach the back of the wearer’s ankle. Increase or decrease the number of rows as you see necessary. Finish off. With yarn needle, sew back of slipper together. 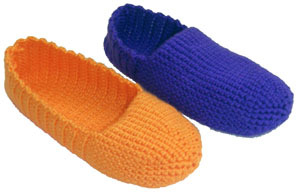 If you need help with crocheting slippers, feel free to leave a comment! Do you need baby sizes? Check out the Crochet Pattern: Baby Mary Jane Slippers – 3 Sizes. This pattern includes the instructions for sizes 0 – 3 months, 3 – 6 months, and 6 – 12 months! Be sure to check out the Crochet Spot Store for more easy crochet patterns! This entry was posted on Thursday, March 19th, 2009 at 10:53 AM by Rachel Choi	and is filed under Free Crochet Patterns. You can follow any responses to this entry through the RSS 2.0 feed. You can leave a response, or trackback from your own site. This cute pattern is the one we’ve chosen for our crochet-along for February in the Ravelry group. I’ve never made slippers yet, so I’m looking forward to it. I already have a colorful yarn in mind. Thanks for such an easy pattern. This is so clever and easy to adapt!!! I am amazed by the results and the versatility of the pattern. I will crochet slippers for the whole family. Thanks. I started making this. and i have large feet. However, when i got to about round 15 or so.. it is very large (around). Are these supposed to be tight fitting slipper or loose? Hi Jackie, the slippers can be as loose or as tight as you want them to be. When I crocheted mine, they were tight enough to stay on my foot, but not as tight as a sock would be. Be sure to adjust the slipper to fit your foot by using the notes that are within the pattern. I am trying to figure this out. It is cute and I want to make them, but there is no way to see how long to start your chain. How can I figure that out? Hi Tania, the patterns starts with “Round 1: ch 2, 6 sc in second ch from hook” so you’ll only start by chaining 2. Then you’re going to make 6 single crochets into the second ch from your hook. That will form a small circle and as you keep crocheting that circle will get bigger and bigger. You don’t need to start with a long chain for this pattern, just the chain 2. Thanks Rachel for including my slipper photo in the Photo Round-up # 4! I added a Rug Grip Spray to the bottoms for non-slippiness. And I double-crocheted an edging around the opening, then threaded a tie to snug it up a bit for my big feet. They make a cute little bow tie in front. I put a padded insole inside, because I didn’t use a particularly soft yarn (I wanted the slippers to hold up a long time). The pattern is great and I had a lot of fun doing it for the crochet-along. How much yarn does it take? Is 244yds enough? Hi Madi, it depends of the size you want to make. For an adult size about 100 yards per slipper should be enough. Hi Amy, this pattern requires some measuring while you crochet it. The beginning circle should be slightly smaller than the wearer’s foot. I can’t tell you exactly how many rounds to add because your gauge will probably be different than mine even if you use the same hook. So measure the circle as you make it to be sure it turns out the correct size. If you don’t have the foot your are making it for with you, then you can do some searching online for a foot measurement chart or take measurements of the person’s foot so that you can use it while your are crocheting the slippers. Hi Bev, the pages are programmed to be printer friendly, so you should be able to use the print function in your internet browser and it should only print out the pattern and not the comments at the bottom. My foot is 9″ long and I wear a size 10. Aditi, let me know which part you need help with so that I can help. Hi Shirley, a quarter of an inch should be good but it depends how snug you want your slipper to be. For rounds 9 – 27, the total number of stitches will be the same as the total number of stitches on the last round of the circle so you don’t have to worry about decreasing as long as you make the initial circle the correct size for your foot. Appreciate it very much!!! Thanks for replying! Hello again! I managed to get the front/toe part done. I’ve tried it on and it fits me like a glove all around. But,I’m stumped again! Help! Row 28 confuses me. Are you crocheting around the side,bottom, then onto the other side? Rows 29-43 is also confusing. I wish you had some kind of visual photos for crocheters like me. Thanks in advance for any help you can give me. Shirley, yes you are correct. You crochet along the side, bottom, then along to the other side in one continuous row. Rows 29 – 44 extends the sides and bottom of the slipper until it reaches the back of your heel. Hi Lola,if there are the same number of stitches on each row, then it’ll be the same size of each row. Try and make sure you’re not accidentally adding stitches. Also, when you measure the circle keep in mind that there’s the diameter (across the circle) and the circumference (around the circle) measurement. You may be trying to compare different measurements. If you’re holding the slipper flat after you crocheted a few rows of single crochet then you’re actually measuring 1/2 the circumference. If you want to measure the diameter you’d have to hold it like a cup or bowl shape. Hello, I am on Ravelry.com and I found this pattern! Super CUTE! By chance do you have a pattern for the strap? If you do that would be great! Thanks! Amy, you can make a chain as long as you want your strap then do a row of double crochet on top of it. You can use the spaces between the stitches as button holes or you can do a chain and skip a stitch for a button. Have fun with it! The slipper is very cute but I am confused about the adjustments. To adjust you said simple add or subtract rounds. If I subtract rounds how do I still get the 48 sc in round 8? Hi Ife, when you adjust the number of rounds you’ll also be adjusting the stitch count. For example, if you end up only needing 7 rounds to make the circle the correct size for your foot, you’ll skip to round 9 and do the “sc in each sc around” but you’ll only have 42 single crochets as your stitch count. Love the slipper pattern but I’m not sure how to stitch the slipper together. Can you please explain how it is to be put together? I can’t make heads nor tails of this pattern. why begin with rounds? Is the the instep? The sole? I just don’t see how the shape of a circle will turn into anything that resembles a slipper. Someone tell me which part of the slipper I’m working on for each change. For round 1 – 8: you will be creating the very very tip of the toe of the slipper. It will make a circle shape. Just make sure that the circle is not wider than the width of the wearer’s foot (the distance form your big toe to little toe). For round 9- 27: you are creating the front of the slipper. It is sort of a tube like shape. You should now have the top and bottom of the front of the slipper since the wearer should now be able to slip their foot into it comfortably. If it does not fit snugly around the foot, then it is too big or if it does not fit on the foot at all, then it is too small. For row 28 – 43: you are no longer going to crochet in rounds. These rows will continue the bottom of the slipper until it reaches the back of the wearer’s heal. This is were you will stop and sew the back of the slipper up. I’m confused about round one. Do we make a magic circle first? Or are we meant to crochet 6sc into the center after joining with the 2sc with a slip stitch? I feel completely confused! Help please! You will chain 2, then make 6 single crochets all in the second chain from your hook. The second chain from your hook is the first chain that you made. This will create a small circle. If you prefer you can make a magic circle, then make the 6 single crochets into the circle. It is a different method, but you will get the same result. Thanks for the great pattern! Took me a little time to grasp it all but once I’d finished the first pair I was jumping to make the next, and now looking at the wool bag for another pair, or two. These are the only slippers my 92 year old mum can wear now so she is just loving them. Hi. I do love this pattern…. but blowed if I can make it work. I’ve started four times now, and each one has been just too big. I reduced the number of stitches each time, but even only having 36 stitches, it’s mansized…. and that’s with using double knitting wool instead of the size you say. It seems to me that once you finish the toe part and begin the front part, it does get wider (and no, I haven’t added any stitches). Very frustrating. Not sure what I’m doing wrong…. arrgghhh!! Hello! It is suppose to be pointed in the back, at least when you first sew it together since it’s a straight line. After you wear it a few time it should go away though and start forming to your foot, which is curved. I love these slippers!!! I did it with a thicker wool so didn’t have to do as many as you would have to and the slippers turned out thicker which is good. I made 2 pairs for mum and I, mums have a crocheted flowers on one side of the slippers and i crotched a strap to go across the top of my slipper and secured it with a button to make them look a bit like Mary-Jane slippers. Thank you again for the faabulous pattern!! This is a great pattern and just what I’m looking for. Thank you! Picture looked cute but I was disappointed once I started reading the directions. I had hoped to make a pair of slippers for my uncle but since he lives 2 states away, there is no way I can measure his foot while making these. I do not understand how the circle will curve in. HELP! I am up to about row 11 and it just looks like a bowl! Hi Grace, it is suppose to look like a bowl. Sounds like you are doing it right! Hi Maria, what size yarn and hook did you use? Sorry carmen for late reply., hectic doesn’t come close! I used a 4mm hook and a dk acrylic yarn which doesn’t look thick but when you are using it it really keeps its shape so doesn’t press down easily, if you know what i mean?! Thanks for the free pattern! I have just started it, but am looking ahead to crocheting the flat part that extends to the heel. In your picture it looks like these rows of 30 sc sts take on a ribbed appearance. Do I crochet into the back loops only to achieve this effect, or is that how it will look if I crochet through both loops of each sc st? Thanks again. Hi Barbara, yes you can crochet in the back loops only for the ribbed look. If you prefer to not have the ribbed, you can crochet in both loops. It’s completely up to you! Have fun with it! The easiest directions to follow! The easiest and fastest slippers to make! I made 2 pair while “watching” the Super Bowl. At the end of each round, am I supposed to join with a slip stitch? I’ve been doing afghans since I started crocheting, so this is a new thing for me. The toe part seems to be too tight, and I can’t figure out what it is that I’m doing wrong. Hi Terry! No slip stitch needed. If the toe is too tight on your foot, you can add more increasing rounds to make it wider. I have enjoyed crocheting these slippers. I made a pair for my Mother for Christmas and now she wants me to crochet her 2 more pairs as she loves them. Thank you for posting this pattern. Hi! I just finished the first slipper and everyone here wants one <3 <3 <3 , at first is hard to understand how it goes but later you realize how easy it is!!! And you can make tons of versions 🙂 thanks a llt for this pattern, ill post pics of the finished versions! Can you tell me please if version 2 is made using all double crochet stitches? Thank you. The easy adjustable socks uses single crochet. The adjustable quick socks use the linked double crochet stitches. The adjustable quick socks version 2 uses the linked treble crochet stitch, and some single crochet for the toe and heel. Sorry about that! Version 2 of the slippers is made with single crochet. Hi Sam! No need to add a slip stitch. You will continue to crochet in the round, like a spiral. Hi Angelica, you will start with round 1. It is worked from the toe up towards the heel.